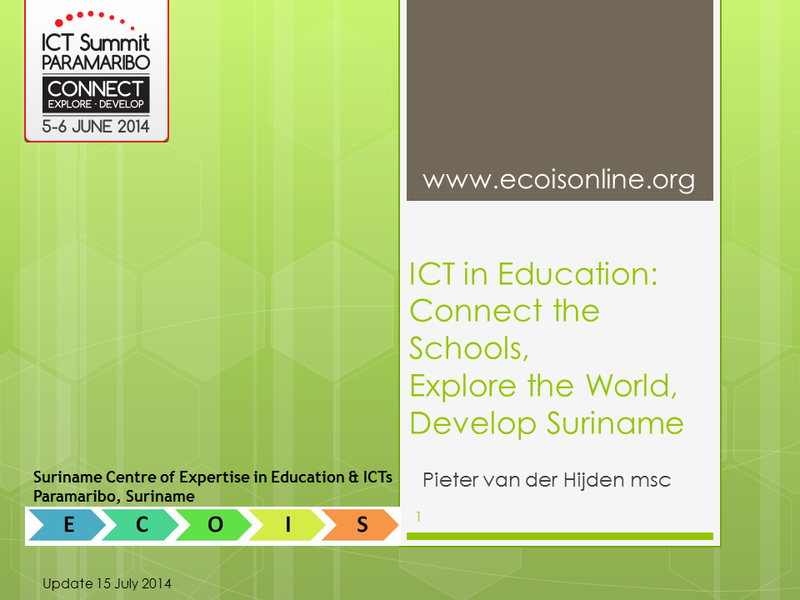 Presentation by Pieter van der Hijden MSc, on behalf of ECOIS, Suriname Centre of Expertise in Education & ICTs; ICT Summit Paramaribo; Connect, Explore, Develop; 5-6 June 2014; Update 15 July 2014. Globalization – Since the 90ties a stream of management literature predicted or even prescribed tremendous changes in the world. The central concepts were globalizing of the economy resulting in a global market, made possible by ict. To compete existing industries had to be re-designed for that future. Learning organizations – To cope with the new challenges companies could no longer depend on a few gifted individuals. They had to change into learning organizations. Author Peter Senge identified five disciplines organizations should develop: Personal mastery, Mental models, Shared vision, Team learning, and the fifth and most important one: System thinking. What was needed for companies, was also needed for schools. Hence, Senge’s later book on “Schools that learn”. The third industrial revolution – The newest predictions of profound changes came quite recently. 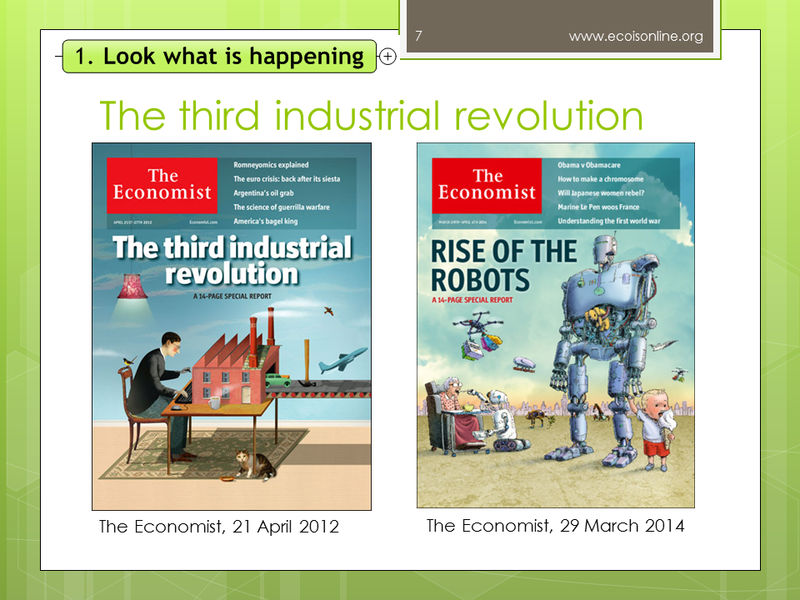 In 2012 The Economist announced the third industrial revolution, focusing on new processes, new materials and more powerful and cheaper digital production machines that eventually might convert your desktop into a factory. In March 2014, The Economist signaled the rise of the robots, due to again lower prices, easier software and more standardization. IT hype cycle for education – While new developments emerge faster and faster, it is also wise to reflect on what their potentials are. Gartner, a research company, found that almost all new ICT related development follow a hype cycle, as they called it. The world is so eager to adopt new developments that the expectations are inflated. Sooner or later that must lead to disappointment and a diminishing interest. The real innovations will survive that dip and finally reach a steady state. The picture of the IT hype cycle for education makes clear how education policy makers and managers are bombarded by new developments and how difficult it will be to take the right decisions at the right time. Bottom line – Globalization and ICT related new developments will have their impact on Suriname and on education in Suriname as well. The relative backlog of Suriname can become an opportunity for progress. Suriname can learn from the past failures by other countries and hence move forward much faster. The “law of the stimulating backlog” applies. This citation summarizes a policy document and action plan from 2007. The document is very positive about the potentials of Suriname’s economy. It stresses the importance to introduce technology and knowledge in all sectors. The report recommends to 1) Apply “high tech” in all sectors, 2) Grow the “make industry“, 3) Maintain a healthy balance of resource exploitation (which implies including the whole country in economic development). Is the population of Suriname ready for the recommended economic development? The national census 2012 gives an insight in the actual education level of the population of 15 years and older. 7% has no completed GLO, 24% has GLO only, and 36% VOJ only (MULO and LBGO). Only 1/3 of the 15+ population has secondary education at senior level or tertiary education completed. To bring all sectors of the economy at “high tech” level, the level of education of the workforce has to rise drastically. Looking at the presence of “high tech” in the private life of the population, the national census 2012 shows that in 2/3 of the households nobody used the internet (in the three months before the census date). In 1/3 of the households at least 1 member did, in 19% of the households only, internet use happened at home. So, “high tech” did not penetrate private lifes so far. Nevertheless, given today’s popularity of internet enabled smartphones (which were almost absent when the census took place, in 2012), this situation might improve rapidly. In 2013 MINOV organized a survey on the state of ict in (pre)primary education. 49% of the schools that responded had one or more computers. These were mostly used for administration, teacher training and class preparation by teachers. 19% of the schools that responded had a computer lab, a dedicated space with a few (average 5) computers. About half of them were used for ict training to the pupils, only 3% of the schools had a lab that they used for supporting their pupils in all courses (i.e. not only ict) (as well). 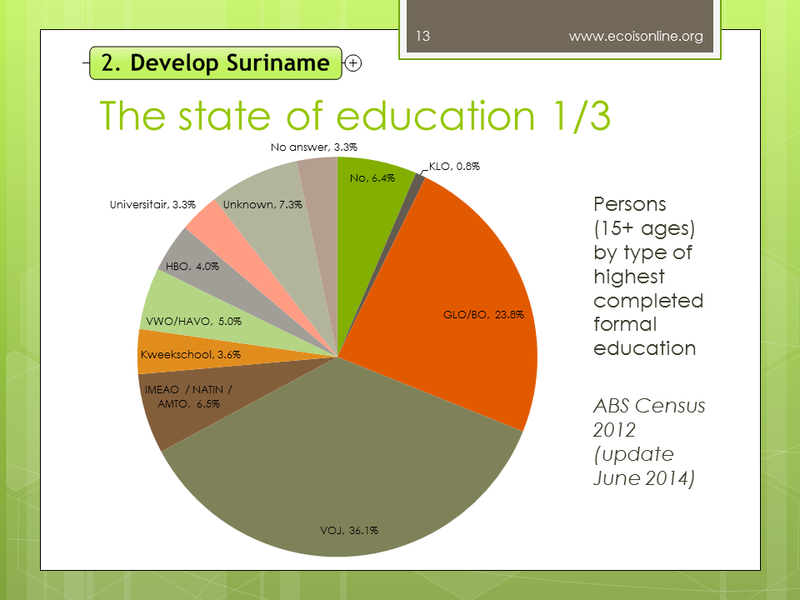 Fortunately, a lot of improvements in education are taking place in Suriname. One is the “I believe in you” project and its impact. It aimed at the transformation of (pre)primary education towards pupil oriented and child friendly education. Further, the current Basic Education Improvement Program (BEIP) has led to a range of intermediate results already: the compulsory education will change from 7-12 years old to 4-15 years old, a new curriculum has been developed with learning strands through 11 years of basic education (preprimary, primary and junior secondary). In the new curriculum ICT is mentioned as “development area”. It is supposed to improve the learning process while it is also a topic of study itself (media literacy and ict skills). In February 2014, BEIP released its “National strategy ict in education (pre-primary & primary)”. This coherent strategy makes clear that the most important reason to implement ict in education is to improve the learning process. As such it is just one of the ongoing efforts to improve education and learning. ICT is not leading, but following and supporting the other (pedagogical) developments. The target group for ict in education are all children; also their local communities should be included. Unfortunately, BEIP has insufficient resources to implement the proposed strategy. At the moment only a few pilots are considered. Another ongoing improvement is Progress-project “the new teacher”. From 2017/2018, the new entry level for all pedagogical institutes incl. IOL will be VOS. The exit level will be Bachelor! The curriculum will consist of 2 base years and 2 specialization years. It must be admitted that the role of ICT in the new curriculum, i.e. the training in “digital didactics” is still a challenge. To conclude also in the technical and vocational education and training (TVET) in Suriname various improvement projects are underway, both at junior and at senior secondary level. Bottom line – Suriname is a country rich of resources and with a high potential for future economic development. A “high tech” workforce is needed in all sectors and all over the country. Ongoing improvements in education are on the right track, but their speed might be higher. They further should extend their focus from mainly (pre)primary to all school types. Further, improving the regular formal education is not enough, it simply takes to long to wait for the new generations. Given the state of the education today, massive adult education is a must. As only the number of teachers will be insufficient for such an effort, adult education in the traditional way is not possible. Blended learning (a mix of classroom learning with distance education) seems a viable solution. 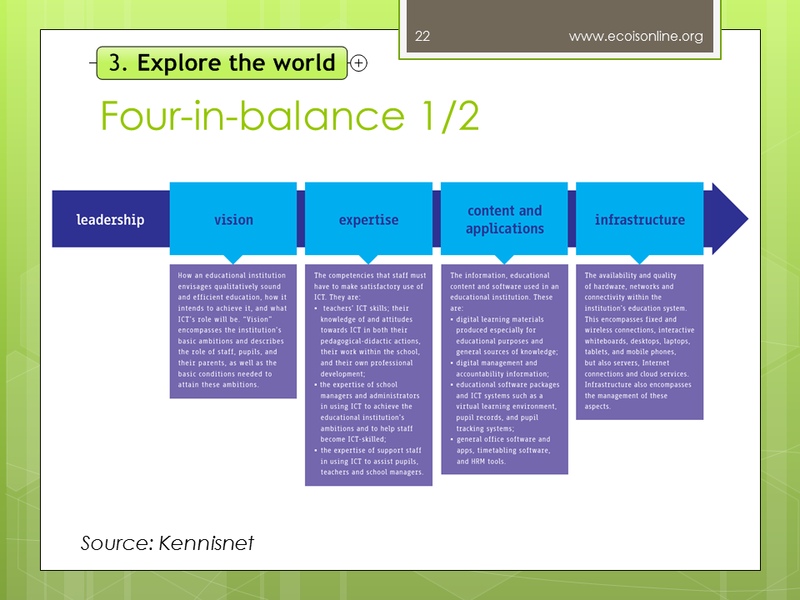 When we explore the world for useful methods, tools, content and apps for Suriname, the four-in-balance model might be very useful. It stresses that successful implementation of ICT in education only is possible if vision, expertise, content & applications and infrastructure are in balance. ICT can be used for education at various levels: the management of the education sector, the school administration, the in-service training of teachers, the support of teachers in lesson preparation, as an object to be taught (media literacy, ict skills), and for supporting/improving of the learning process. The latter brings the most benefits in the form of pupil motivation, pupil performance, streamlined learning process and increased access to education (distance education). The world is full of “content” and applications for education, often they are even free available. The supply ranges from open repositories of single media, like a video clip, to complex formats of collaborative learning by many schools together. Just to mention a few examples: Khan Academy is an open repository of instruction videos, Wikiwijs is a Dutch database of open educational resources, Google Apps for Education is an example of web applications, Coursera is a portal where you participate in many Massive Open Online Courses (MOOC) at academic level (almost free), and iEARN is an international project in which many schools participate and collaborate. Finding free content is the first step. What follows is adapting the content to the local context, i.e. localization. Often localization is only a matter of translation. Sometimes that is not enough; localization will be extended to adapting multimedia or action patterns. 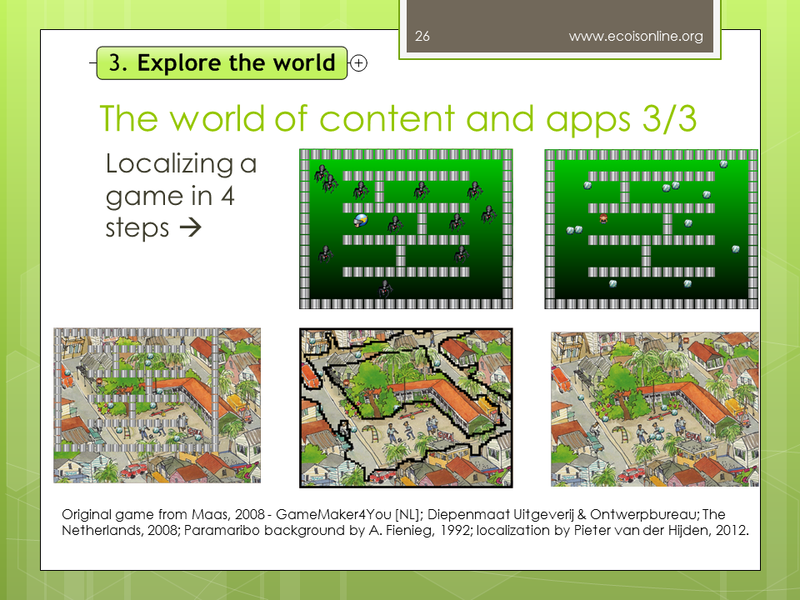 As an example of localization, the author changed a simple entertainment game in a neutral context into a learning game in the context of urban Suriname. 1) In the original game the player is represented by a helmet. He/she walks through a maze while hunting ants. 2) The helmet is replaced by a girl, the ants by litter (slowly moving). 3) The background is replaced by a cartoon-like picture of a school and its neighborhood in Suriname (and the size of the game stretched to full screen). 4) The maze (bricks that hinder your move) are replaced by smaller ones that can be located more precisely. The new bricks are placed in such a way that the girl can only walk on the streets and on the school playground (thus converting the background from just a “wallpaper” into a relevant game element). 5) The bricks are made invisible, but they are still there. The initial position of the girl and the litter has been optimized. Managers, teachers and staff need to be qualified to apply ict in education in the right way. In the case of the teachers, they need to develop “TPACK”, technological, pedagogical, content knowledge (also called digital didactics). That is more than ICT skills alone. ICT skills have to be integrated with content expertise and pedagogical skills. Common expertise has to be built up as well. Knowledge management on ict in education has to be in place. Ideas are welcome, but their feasibility has to be demonstrated in pilots. Pilots are great, but their benefits for both pupils and teachers have to be evaluated. Ultimately, evidence is needed about these benefits. Fortunately, more and more evidence based research becomes available. Bottom line – In the spectrum of contributions which ict has to offer to education, the main challenge is ict supporting the learning process. Evidence based research demonstrates that the teacher is the most critical success factor. ICT should match their existing teaching practices. Only in that case, ict may improve a pupil’s learning output. Inspiration should be followed by Existence; the latter by Perception and Evidence. In short, there are still villages without schools, schools without electricity and water (let alone internet), schools without teachers and teachers without qualifications. In our view all schools need a computer lab with internet and a local network, every class needs a projector (digital board) with a computer and internet and maybe a few computers more. This technical infrastructure should be available for use by parents and local community as well. It may also enable inter-school communication and inter-community cooperation. Bottom line – Every school and every local community should be online as soon as possible. Start with the difficult ones and apply (cheap) satellite communication where internet via local telecom providers is not an option. Start inter-school communication via the internet as soon as possible. Bring every school (and local community) online ASAP; start with the difficult ones (far away) and work from there towards Paramaribo. Facilitate educational research and annual survey (compulsory and including VOJ and VOS too). 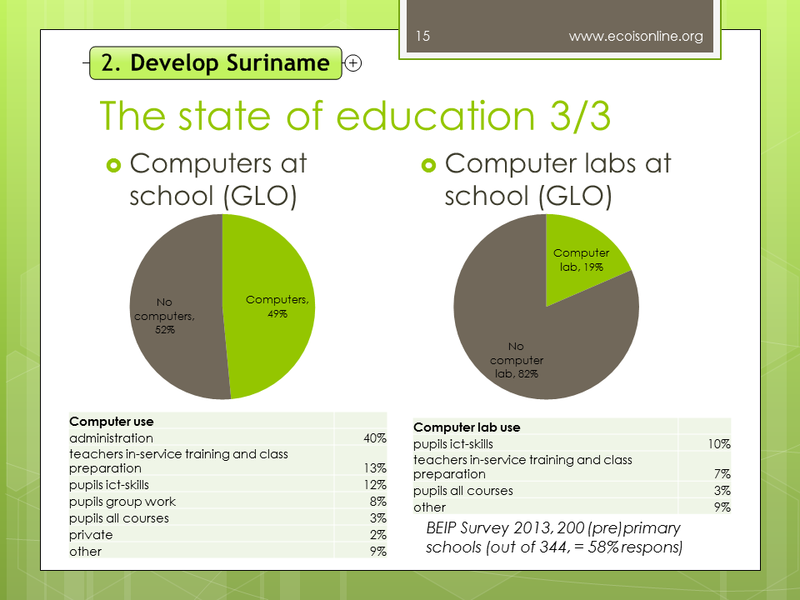 Bottom line – ICT in education implies opportunities for Suriname’s ICT industry. Of course, the local ict industry could supply hardware and generic software, install and maintain it. Further, they could supply internet connections, local networks and virtual learning environments in every school and manage them. Finally, if they develop the right expertise, they may get involved in the localization of learning materials. Technisch voorstel: proefproject bijscholing leerkrachten binnenland via modern afstandsonderwijs; Pieter van der Hijden en Ton Wolf; ECOIS, 2010. 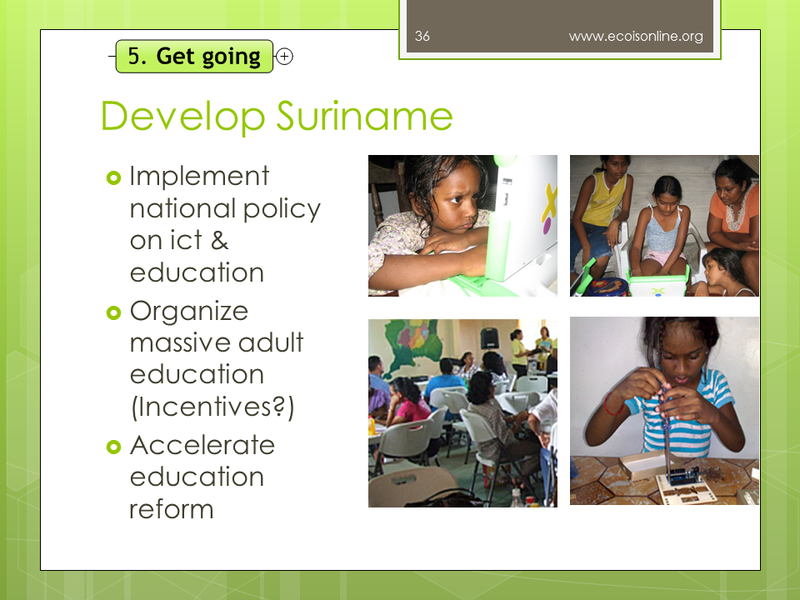 ECOIS, the Suriname Center of Expertise on Education and ICTs, would like to thank the organizers of the ICT Summit 2014 to give the opportunity to present its vision on ict and education in Suriname. Bottom line – Let’s exploit the “Law of the stimulating backlog”! The members of the ECOIS-team are Pieter van der Hijden, Marco Ligtvoet and Lucenda Plet (info@ecoisonline.org). The full presentation can be downloaded from http://slidesha.re/1parHPW.